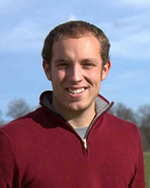 Lawrence, Kan.: Rutgers University student Christopher Tyler MacKenzie has been selected as the Vickers Scholarship winner among 14 students earning 2011-12 scholarships from the Trans-Mississippi Golf Association (TMGA) through its Turf Scholarship Fund. MacKenzie, 24, will receive a $7,500 scholarship as he completes his education in the Rutgers' two-year Golf Course Management Program this month. He also receives the Vickers Trophy, a bronze sculpture of Old Tom Morris. "With two people close to me, my father and his assistant, both having won Trans-Miss scholarships, to join them with that — especially my dad — it's kind of a legacy deal," said MacKenzie of Forest Lake, Minn. "I didn't know the (TMGA) has been around as long as it has. To know that I was awarded the top Trans-Miss scholarship, it's an honor." MacKenzie, whose father John is superintendent at North Oaks (Minn.) Golf Club, currently carries a 3.79 grade point average in Rutgers' Golf Course Management Program and has completed internships at Oakmont Country Club and the TPC Twin Cities. He has volunteered on the maintenance staffs of several key golf events, including the 2009 PGA Championship, the 2008 U.S. Women's Open and two 3M Championships. "Tyler MacKenzie is a highly motivated and extremely intelligent individual," says Edward V. Lipman Jr., MacKenzie's academic advisor at Rutgers. "His roots in the golf turf industry run very deep as his father has been a superintendent for over 25 years, and based on Tyler's performance in his first year in the Rutgers Professional Golf Turf Management School, it is clear that it is his intention to walk in his father's footsteps and become a successful golf course superintendent." MacKenzie earned a bachelor's degree in economics from Wisconsin-Eau Claire before moving to Rutgers. "Education is unbelievably important. Every year technology changes and information changes," MacKenzie said. "You've got to keep yourself educated, whether it's reading articles put out in magazines or anything like that…it's like everything nowadays, you just have to stay on top of the turf field." The Trans-Mississippi Golf Association is one of the oldest and most prestigious golf organizations in the United States. Established in 1901, the Trans is composed of more than 200 member clubs located throughout the country. The Association is governed by a board of independent directors and is headquartered in Lawrence, Kan. Since the Trans-Miss Scholarship Fund granted a $600 scholarship in 1953 to Colorado State University (then Colorado A&M), the Trans-Mississippi Golf Association has become a national leader in assisting young men and women pursuing careers in turf management. For more information on the Trans-Miss Scholarship Program go to www.trans-miss.com/scholarships.html. This story was reprinted with permission from the Trans-Mississippi Golf Association. For more information about this organization, please visit www.trans-miss.com. MacKenzie will receive a $7,500 scholarship as he completes his golf turf education at Rutgers. "Education is unbelievably important...you just have to stay on top of the turf field."